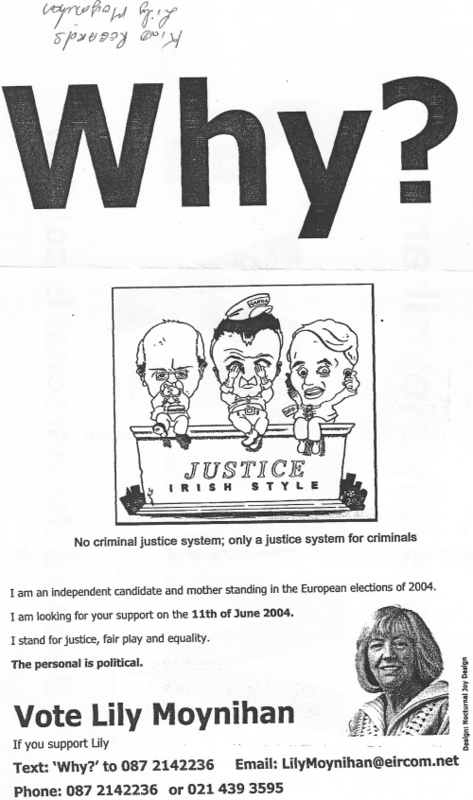 Cork Based Lily Moynihan from the 2004 European Elections. She stood on a justice reform and victim rights ticket. The RTE profile from the time wrote…”She has been active, but unsuccessful, in demanding prosecution of those believed to be responsible for the death of her 23-year-old son, Adrian, who was killed during an altercation with nightclub bouncers in 2001. Her husband, who went on hunger strike outside the Dáil on two separate occasions in 2003 to highlight the case, is her election agent.